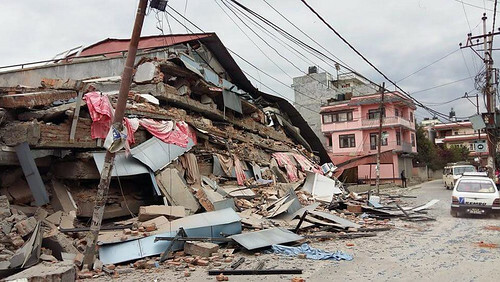 A massive earthquake hit Nepal on 25th April 2015. Practical Action helped relief efforts on the ground, and worked with affected communities to rebuild their homes and their lives. In the aftermath, we delivered water treatment, emergency shelters, energy generation and solar communication technology where they were needed most. Practical Action has been working in the earthquake affected areas in Gorkha and Dhading districts of Nepal supporting the reconstruction work. We provided materials for the construction of toilets and temporary shelters, and cash for livelihood recovery, and carried out road and irrigation canal maintenance, and demolished damaged school buildings. We are working with these communities to help them rebuild their lives and livelihoods. But more than just rebuilding, we have a remarkable opportunity to build back better – this not only means safeguarding families homes from future earthquakes, but also stopping them from inhaling smoke in their homes which slowly kills them, by integrating smoke hoods into the new houses. Practical Action work on disaster risk reduction in Nepal and around the world, to reduce the impact of natural disasters on vulnerable communities. This short film was made by a director who worked with Practical Action to film a TV commercial about our work fighting indoor air pollution. They stayed with an extended family in their home in a small, remote village in the mountains of Nepal, which was near the epicentre of the earthquake. All buildings in Ghachok were destroyed on April 25th 2015, but miraculously no one died.